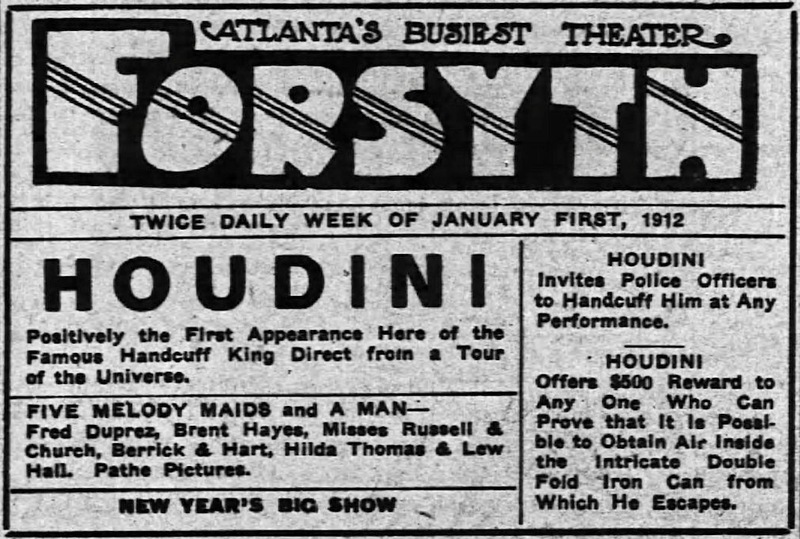 WILD ABOUT HARRY: Houdini plays Atlanta in 1912...and 2019! 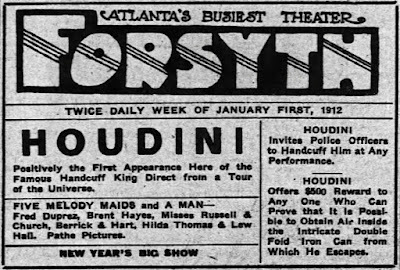 On New Year's Day 1912 Houdini opened at the Forsyth Theater in Atlanta, Georgia. It was his first appearance in Atlanta and one of his rare appearances in the deep South. Below is an ad for his "New Year's Big Show" from The Atlanta Constitution. The exciting news is this year Houdini will return to Atlanta! That's because the popular exhibition Inescapable: The Life and Legacy of Harry Houdini will appear at The Breman Museum in Atlanta, April 14 to August 11, 2019. You can find more details at the Breman Museum website, Facebook and Twitter. I will also keep us updated with all the related programs and events. Inescapable: The Life and Legacy of Harry Houdini was created by magician David London and the Jewish Museum of Maryland. This Monday (January 21) will be the last day to see it in Baltimore before it closes in preparation for its move to Atlanta.